Today, in the 5th part of his tutorial, Nasir studies the working and advantages of an Open Transition Transfer switch. Let’s check what he has to teach! Open transition transfer switches are designed to switch between the normally present power supply; which is being supplied to our homes by the power stations, and the backup arrangement in the form of some generator or anything. They operate between these two supplies depending upon the conditions, if the primary power supply is available or not. They have a switch which monitors the power sources and keeps a check so that whenever the primary source fails to deliver the power, it immediately switches to the backup set of generators. But the major difference that it has from the closed transition transfer switch is that, this switching is not performed immediately, instead there is a short break between the opening of one contact and the closing of the other. The switch that is monitoring both the power sources sets up a signal generator which has to be transferred ahead to the contacts. 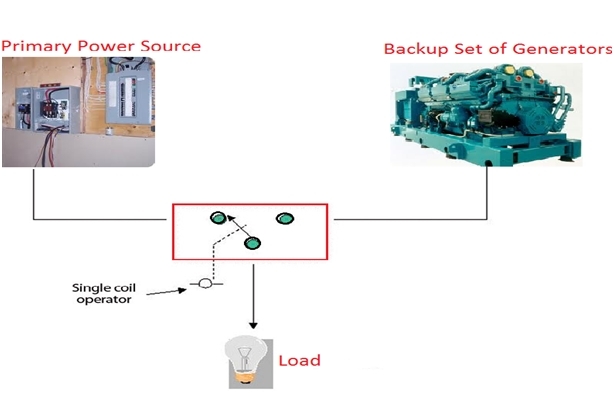 When it senses a hindrance in the power output from the primary source, it sends the signal which then forces the contact to switch from the main power source to the backup power supply. Afterwards, when the sensor notices that the power supply in the primary source has recovered, it makes the contact switch back to the primary source again. Due to this short delay in switching, this type of transfer switch is also known as a “Break before make” transfer switch. Since after it breaks its contact from one power source, it then makes the other contact. But the interruption in the power supply to the load, may be almost negligible, since the time delay in between this switching is very small, as compared to the Delayed Transition transfer switching which has a fixed period delay in between the two switching’s. Now a days, Open Transition Transfer Switches are the most commonly used, espically in usual household applications and for small scale purposes where the load is not so much sensitive. It is best suitable for small or inductive loads, which are not too much sensitive for power break ups. These are very simple to use due to the fact that they have a very simplified construction and are easy to interface with the power supplies. Due to their simplicity and not-so-complex construction, they are cheap in comparison to the closed transition transfer switches. No additional attachments or extensions are needed to be used along with them and they can be straight away interfaced with the external devices and hence become a very reliable option to use. The Reason that these switches cannot be used in sensitive electronic devices or for larger loads is that although there is no proper or fixed time delay, but still there is a short period of supply breakup in which the contact is shifting from the primary power supply to the backup one. This time period is approximately equal to five electronic cycles and is not good enough for sensitive loads. But this transfer time can even be further minimized by adding a phase angle monitoring system so that any unexpected change in phase can be compensated immediately and prevent any problem in the system. 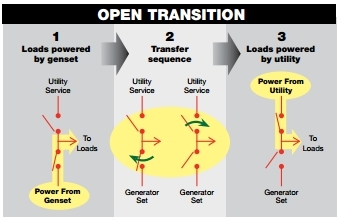 We have studied the working and advantages of an Open Transition Transfer switch. But there is also another remedy for eliminating their time delay, i.e. replacing them by a closed transition transfer switch. So stay tuned to our tutorials to learn more about their working as well, and explore these transfer switches in detail in the next post. or copy this trackback: http://engineering.electrical-equipment.org/panel-building/open-transition-transfer-switch.html/trackback from your own site. So the best one is the closed transition? What are burnouts in Power System and how do they affect the stability of a Power System?